Florence, Italy, or in Avignon, France, during the late 1320s. Formerly bound in 18th- or 19th-century Italian purple morocco gilt with cross in center, two silver gilt clasps; rebound in 1929 by Marguerite Duprez Lahey in full blue crushed levant blind-tooled, with chemise and case lettered in platinum. Commissioned by Cardinal Jacopo Stefaneschi (d. 1343); no. CCCLII in an old Italian collection (inscription at upper margin on front flyleaf); purchased from Lathrop Colgate Harper in Jan. 1927. Ms. missal; written and illuminated in Florence, Italy, or in Avignon, France, during the late 1320s. A colophon on fol. 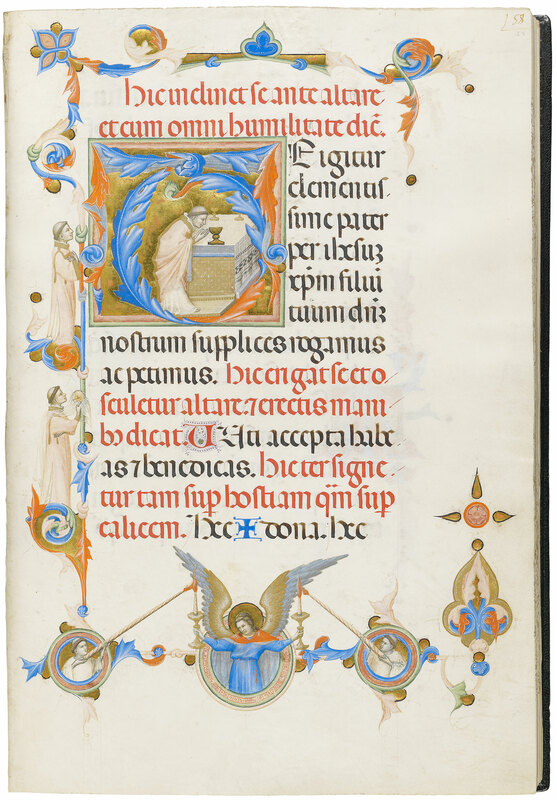 167v states that this is the seventh and final volume of a missal that contains the Ordinary of the Mass and the main prayers of the missal for the Votive Mass and that there are 19 quinterns and 8 leaves: Septimu(m) volum(en) i(n) missali q(u)o e(st) testam(en)tu(m) misse, & ora(tion)es (m)a(io)res i(n) missali s(cundu)m misse votive, & s(un)t q(ui)nt(er)ni xix, & viii carte. It has been suggested that this manuscript is one of a codicologically homogenous group created for Cardinal Jacopo Stefaneschi that were copied by the same scribe and illuminated by the same artist--Cf. Dix siècles d'enluminure italianne (VIe-XVIe siècles). Musical notation: 4-line staves in red ink with square notes throughout. Decoration: 4 historiated initials, 2 historiated borders. Artist: Master of the St. George Codex.